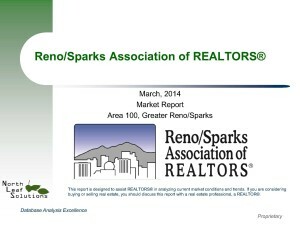 Thanks to the Reno/Sparks Association of Realtors for putting out the March 2014 stats. You can view the full report by clicking the link to the right. Below is a brief overview with notes and video about the report. Median sales price down 3.4% from February but up 16.4% from March 2013. This was expected. A lot of sellers are having to reduce price to get homes sold. We expect the market moving up and down a few points for the foreseeable future. Homes sold was up 20.2% from February but down 5.3% from March 2013. Pretty typical uptick as we leave the cold months. Average days on market for all type of sales was 106. See the regular sales days on market here. New listings were up 14.5% compared to February and up 9.2% from March 2014. Again, warmer weather means more movement. 85% of these new listings were regular sales. That’s great for both buyers, sellers, and home owners. Months supply of inventory is at 3.7 months. That’s low and means we’re still in a seller’s market. The most affordable areas, per the affordability index, are North Valleys, Old Southeast Reno, and Sparks. Posted in For Buyers, For Sellers, Market Update and tagged homes for sale in reno stats, reno home sale stats, reno home selling information, reno listing seller agent, reno seller's market information. ← How long until my home in Reno sells?